The computer programs only take up one chapter of the book – the rest consists of what you might call “manual” tests. In effect they’re all guessing games. Typically you’re asked to do a repetitive task, like guessing the colour of playing cards before they’re turned over, and record the number of “hits” or correct guesses. Then you have to look at the tables in the back of the book (or use a formula for more complicated examples) in order to calculate your “z” score and hence the probability of obtaining that result from pure chance. 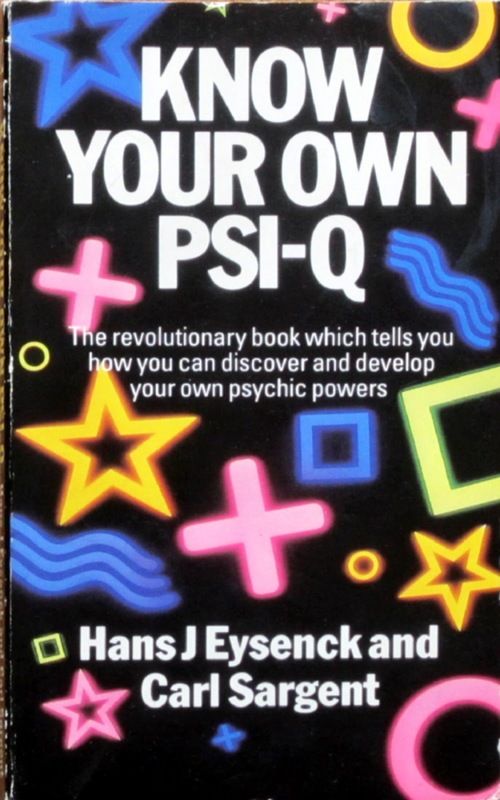 According to the authors, you have “some Psi” if this probability is 1 in 20, “good Psi” if it is 1 in 100, and “excellent Psi” if it is 1 in 1000. There are several problems with this. Firstly, it assumes there is a black-and-white choice between pure chance and ESP, with no other possible explanations. Secondly, if you do a lot of short test runs one after the other (20 of them, say), then the likelihood that one of them will yield a 1-in-20 result is pretty high, by definition (thanks to Peter Harriman for reminding me of this last week, in a completely different context). Finally, if you have to resort to hunting for small deviations from chance, then “extra-sensory perception” is far inferior to regular “sensory perception” (which comes close to 100% reliability and repeatability). 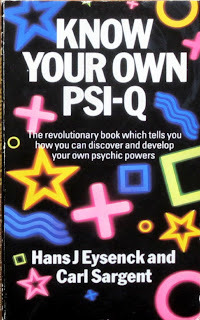 If you want an intelligent discussion of such issues, you won’t find them in Know Your Own Psi-Q – even though the authors, Hans Eysenck and Carl Sargent, were both professional psychologists who ought to have been aware of them. Your money is much better spent on Brian Clegg’s Extra-Sensory, which I mentioned a few weeks ago. Now for my attempt at reproducing one of their computer programs. I’ve simplified it a bit, making it a straight choice between heads or tails. Imagine that the computer has just flipped a coin – and click on “heads” or “tails” according to which of them you think it is. As soon as you do this, the computer will tell you whether you were right or wrong, and immediately flip another coin. So then you can guess again. Keep doing this as many times as you like – the computer will accumulate your z-statistics, but only start displaying them after you’ve had at least 36 guesses. Don’t click the “Restart” button unless you want to clear the statistics and start again from scratch (which you might want to do – as mentioned earlier, a large number of short runs is more likely to produce a high z-score than a single long run). What you’re aiming for is a z-score of 1.96 or higher, corresponding to “some Psi ability” according to Eysenck and Sargent. I had 50 goes and got z=0. Anyone would think I was guessing randomly, rather than being clairvoyant. Yes, but maybe your subconscious was TRYING to get z=0 ... in which case it's a very good example of mind-over-matter. When it comes to mind over matter, I usually find that if I don't mind, it doesn't really matter. That's definitely the case here, Kid. If the best that ESP can do is guess coin tosses a few percent better than random chance, it really doesn't matter whether you've got it or not. Never mind.